Have you seen your favorite athlete running around with a colorful bracelet on their wrist? Also, known as running bracelets, athletes don’t just wear them because they’re incredibly fashionable. They’re worn because they’re believed to significantly improve your performance on the track. If you’re an avid runner who wants to beat their best time or just wants to gain an advantage over the competition, a wristband may be the perfect solution for you. Can Athletic Bracelets Improve a Runner’s Performance? Athletic bracelets aren’t a new thing. They’ve been around for decades. And many famous athletes continue to wear one or more during their competitions. Is it just a fad or have these athletes discovered the secret to improve performance? Athletic wristbands are typically made with negative ion technology, magnets, or both. There are plenty of scientific studies that show both negative ionization and magnets may have beneficial effects on the human body. These wristbands are relatively new on the timeline of negative ions, but that doesn’t discount the potential benefits they offer. Many athletes around the world continue to wear and choose IonLoop bands. Are you ready to join the pros? Make your mark with your very own running wristbands today! 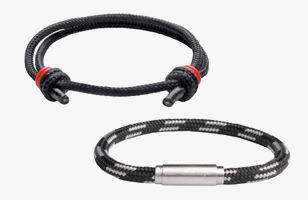 Athletic Bracelets: Stylish and Functional! Most jewelry is worn for aesthetic reasons. A fancy necklace or a shiny ring may look nice, but these things usually need to be removed before playing sports or participating in athletic activities. But active wristbands are different. Not only are these bands stylish, they’re functional too! What do we mean? These bracelets are outfitted with negative ion technology. It’s believed that these ions may have the potential to stimulate the body’s energy supply, enhance focus, and improve recovery time. They’re lightweight and are designed to be worn all the time – even during strenuous activities like exercise.